, a very eminent mathematician and philosopher, was born at Turin, Nov. 25, 1736, where his father, who had been treasurer of war, was in reduced circumstances. In his early days his taste was more inclined to classical than mathematical studies, and his attention to the latter is said to have been first incited by a memoir that the celebrated Halley had composed for the purpose of demonstrating the superiority of analysis. 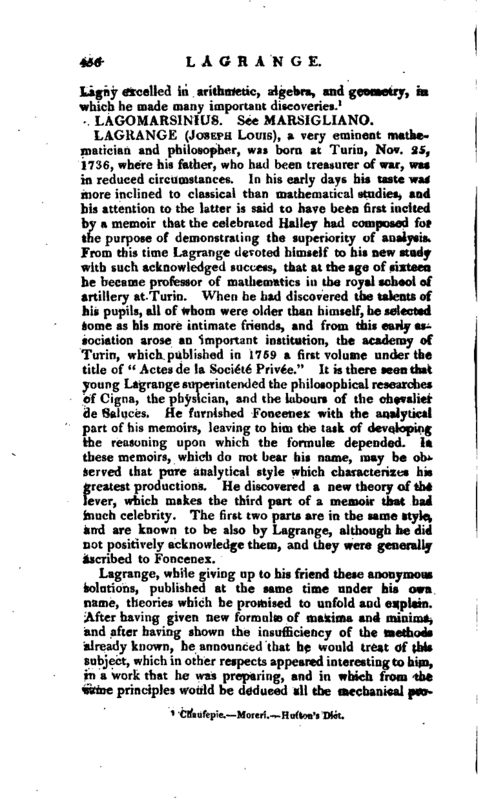 From this time Lagrange devoted himself to his new study with such acknowledged success, that at the age of sixteen he became professor of mathematics in the royal school of artillery at Turin. When he had discovered the talents of his pupils, all of whom were older than himself, he selected some as his more intimate friends, and -from this early association arose an important institution, the academy of Turin, which published in 1759 a first volume under the title of “Actes de la Socie*te* Prive*e.” It is there seen that young ‘Lagrange superintended the philosophical researches of Cigna, the physician, and the labours of the chevalier de Saluces. He furnished Foncenex with the analytical part of his memoirs, leaving to him the task of developing the reasoning upon which the formulae depended. In these memoirs, which do not bear his name, may be observed that pure analytical style which characterizes his greatest productions. He discovered a new theory of the lever, which makes the third part of a memoir that had much celebrity. The first two parts are in the same style, and are known to be also by Lagrange, although he did not positively acknowledge them, and they were generally ascribed to Foncenex. 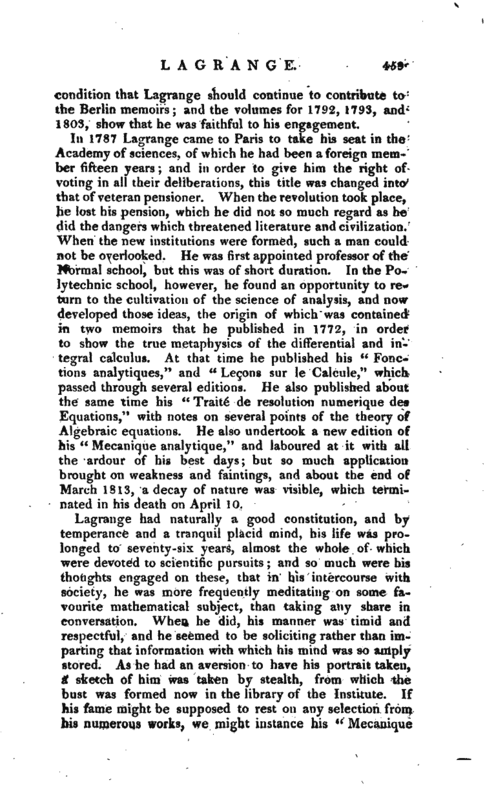 Lagrange, while giving up to his friend these anonymous solutions, published at the same time under his own name, theories which he promised to unfold and explain. After having given new formulae of maxima and minima, and after having shown the insufficiency of the methods already known, he announced that he would treat of this subject, which in other respects appeared interesting to him, in a work that he was preparing, and in which from the same principles would be deduced all the mechanical | properties of bodies, whether solid or fluid. Thus at the early age of twenty. three, he laid the foundation of those great works which have attracted the admiration of the learned. In the same volume he applied the theory of recurring consequences and the doctrine of chances to the differential calculus, which till his attempt was worked by indirect methods, but which he established on more general principles. Newton had undertaken to reduce the motion of fluids to calculation, and had made researches on the propagation of sound. His principles Lagrange found insufficient, and some of his suppositions inaccurate. This he demonstrated he founded his new researches on the known laws of Dynamics by considering only the particles in air that are in a right line, he reduced the problem to that of vibrating chords, upon which the greatest geometricians had differed. He showed that their calculations were insufficient to decide the question. He therefore undertook a general solution of it by an analysis as new as ingenious, by which he reduced at the same time an indefinite number of equations, and which included continued functions. He established more firmly Bernoulli’s theory of the mingling of simple and regular vibrations, showed within what limits this theory is accurate, and where it becomes erroneous. He then arrived at the construction given by Euler, a true construction, though discovered without any rigorous calculations. He also answered D‘Alembert’s objections. Euler perceived the merit of the new method, which he made an object of his profoundest meditations; but D’Alembert proposed numerous objections, which Lagrange afterwards answered. 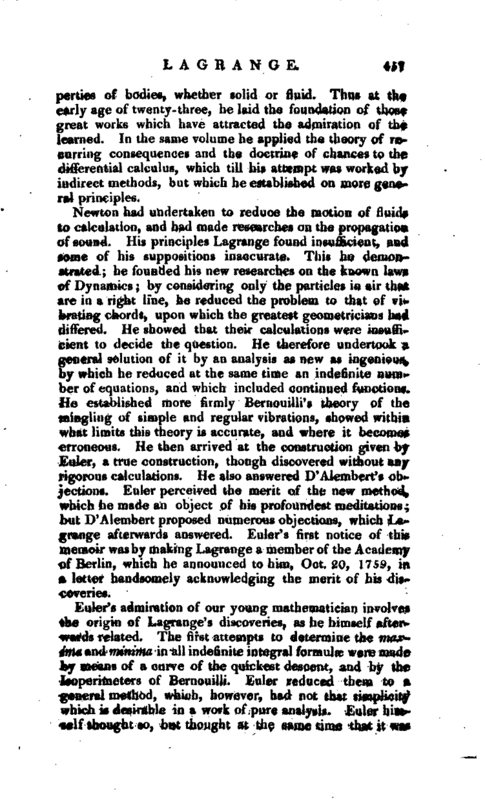 Euler’ s first notice of this memoir was by making Lagrange a member of the Academy of Berlin, which he announced to him, Oct. 20, 1759, in a letter handsomely acknowledging the merit of his discoveries. Euler’s admiration of our young mathematician involves the origin of Lagrange' s discoveries, as he himself after^ wards related. The first attempts to determine the maxima and minima in all indefinite integral formulae were made by means of a curve of the quickest descent, and by the Isoperimeters of Bernouilli. Euler reduced them to a general method, which, however, had not that simplicity which is desirable in a work of pure analysis. Euler himself thought so, but thought at the same time that it was | conformable to truth, and that by means of sound metaphysics it might be made extremely evident; but this task, he said, he left to those who made metaphysics their study. While the metaphysicians took no notice of this appeal, Lagrange’s emulation was excited, and he soon discovered the solution that Euler had despaired of, by analysis; and in giving an account of his process, he said that he considered it not as a metaphysical principle, but as a necessary result of the laws of mechanism, as a mere corollary of a more general law, which he afterwards made the basis of his celebrated work, entitled “Mecanique analytique.” We see also the germ of this work in the paper he wrote when the Academy of sciences proposed as a prize question, the theory of the moon’s libration, on which subject he had an opportunity to apply the principles of his analytical discoveries. 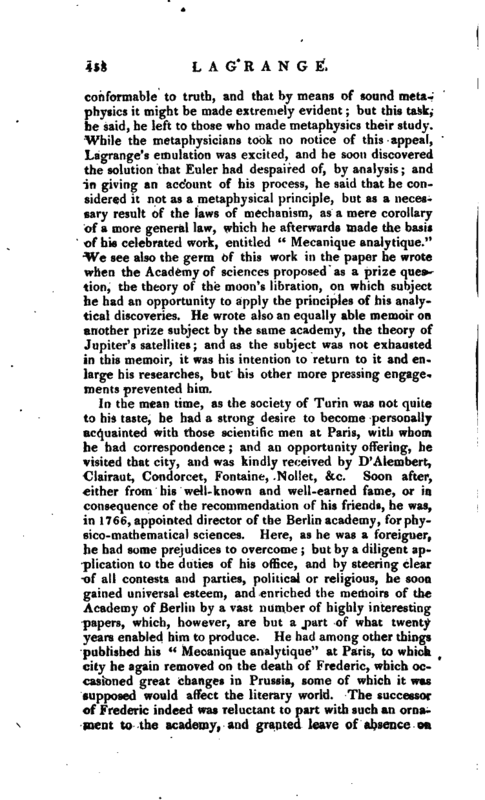 He wrote also an equally able memoir on another prize subject by the same academy, the theory of Jupiter’s satellites; and as the subject was not exhausted in this memoir, it was his intention to return to it and enlarge his researches, but his other more pressing engagements prevented him. In the mean time, as the society of Turin was not quite to his taste, he had a strong desire to become personally acquainted with those scientific men at Paris, with whom he had correspondence; and an opportunity offering, he visited that city, and was kindly received by D’Alembert, Clairaut, Condorcet, Fontaine, Nollet, &c. Soon after, either from his well-known and well-earned fame, or in consequence of the recommendation of his friends, he was, in 1766, appointed director of the Berlin academy, forphysico-mathematical sciences. Here, as he was a foreigner, he had some prejudices to overcome; but by a diligent application to the duties of his office, and by steering clear of all contests and parties, political or religious, he soon gained universal esteem, and enriched the memoirs of the Academy of Berlin by a vast number of highly interesting papers, which, however, are but a part of what twenty years enabled him to produce. He had among other things published his “Mecauique analytique” at Paris, to which city he again removed on the death of Frederic, which occasioned great changes in Prussia, some of which it was supposed would affect the literary world. 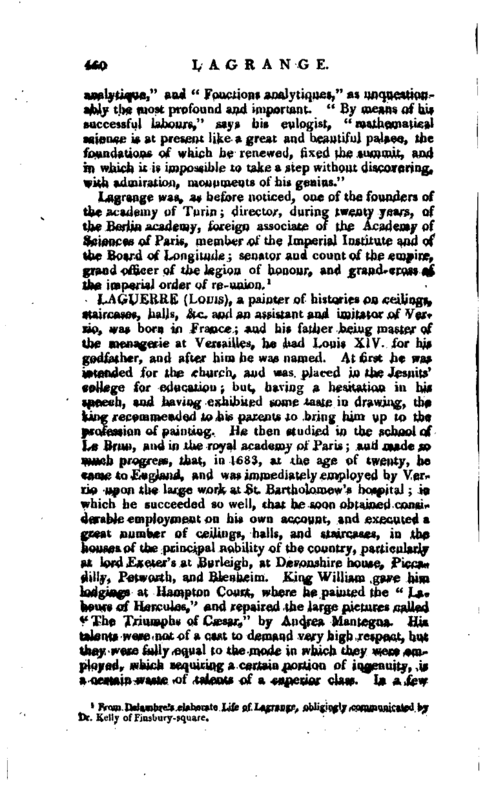 The successor of Frederic indeed was reluctant to part with such an ornament to the academy, and granted leave of absence on | condition that Lagrange should continue to contribute to the Berlin memoirs; and the volumes for 1792, 1793, and 1803, show that he was faithful to his engagement. In 1787 Lag-range came to Paris to take his seat in the Academy of sciences, of which he had been a foreign member fifteen years; and in order to give him the right of voting in all their deliberations, this title was changed into that of veteran pensioner. When the revolution took place, he lost his pension, which he did not so much regard as he did the dangers which threatened literature and civilization. When the new institutions were formed, such a man could not be overlooked. He was first appointed professor of the Normal school, but this was of short duration. In the Po lytechnic school, however, he found an opportunity to return to the cultivation of the science of analysis, and now developed those ideas, the origin of which was contained in two memoirs that he published in 1772, in order to show the true metaphysics of the differential and integral calculus. At that time he published his “Fonctions analytiques,” and “Lemons sur le Calcule,” which passed through several editions. He also published about the same time his “Traite de resolution numerique des Equations,” with notes on several points of the theory of Algebraic equations. He also undertook a new edition of his “Mecanique analytique,” and laboured at it with. all the ardour of his best days; but so much application brought on weakness and faintings, and about the end of March 1813, a decay of nature was visible, which terminated in his death on April 10. From Delambre’s elaborate Life of Lagrange, obligingly communicated by Dr. Kelly of Finsbury-square.